Based on my readings and experiences, I have made some general observations on the functional evolution of the new ballparks. I cover specific topics, such as sightlines and seats, in other articles. The new ballparks of the past 20 years have hardly deviated from the large lower deck/club/suite/upper deck formula. There are few fundamental differences between New Comiskey Park and Target Field 20 years later in terms of the seating structure. While I’ll cover the some of the evolution in stadium design, I’ve never quite understood the efficiency of using one concourse for a 40-row lower deck, initially accessible for all fans in the ballpark. I also question the merit of having such a large, monotonous lower deck with such a gentle slope to the field. Coors Field (1995) and Target Field (2010). There has been little deviation in seating structure: most use the same formula. That being said, all of the retro ballparks have generally used this approach, and it works fine. Turner Field is the only one to deviate from the formula, providing dual concourses on the first level. Other parks, such as AT&T Park and New Yankee Stadium, have larger than usual premium sections around the infield that are separated from the main concourse. While this fixes the concourse efficiency problem, having large premium seating that engulfs the lower bowl is too fan unfriendly in my mind (the line is crossed when there’s no access to the dugout before the game). 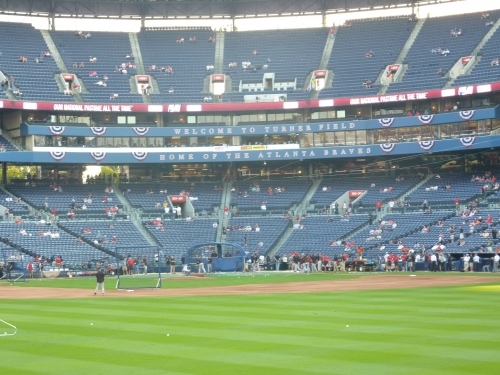 While Turner Field’s dual concourse makes the most sense from a logistical perspective, it also creates a subjective unwanted degree of separation and confusion. In addition, the lower concourse under the seating is naturally going to be closed from the field. All of this negates the potential benefits in my mind, even though having some sort of below level concourse is more efficient. Turner Field’s duel concourse system in the lower bowl. One concourse is above the seating bowl and the other is underneath it. Crowding is non-existent here. While rare, I prefer the new ballparks that provide a middle walkway for the lower bowl, namely Petco Park and Kauffman Stadium. This maximizes flow and eliminates overcrowding while maintaining a sense of interconnectivity with a main concourse. I think Kauffman Stadium accomplishes a perfect and unique balance from a functional point of view: while the main concourse is above the seating bowl, there is also a small, non-premium enclave (but not a separate concourse) below the bowl, accessible from the middle walkway. This gives the fan sitting in the lower box seats a separate public area, eliminating crowding, while maintaining the flow and interconnectivity of the main concourse above. New ballparks provide open concourses to keep fans connected to the game even when they leave their seats. Fans can see the game from a multitude of vantage points. This encourages fans to explore the ballpark (i.e. buy concessions, seek out other amenities) while keeping in touch with the game. The “third inning stroll” especially makes economic sense. The only drawback is the elimination of the psychological “embrace and release” concept, where the fan enters a dark portal and explodes onto the green field. As ballparks have evolved, there has been an increased emphasis on outfield standing room areas. 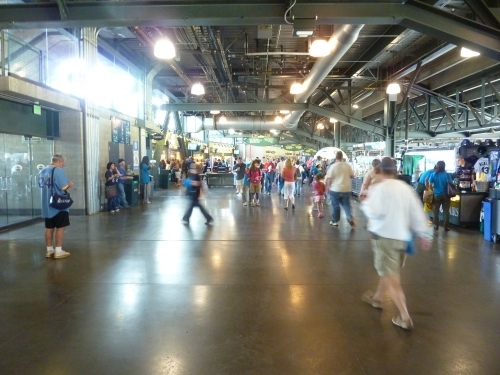 In recent years, ballparks have provided a concourse open to the field on the upper level as well by splitting the upper deck. The wide majority agrees that providing fans with views of the playing field from the concourses is a good concept, but it can get controversial in the upper deck. Some call this concept overrated, because you can’t actually see the action from most of the concourse: this is especially true from the upper deck. Very little of the infield is viewable from much of the concourse. 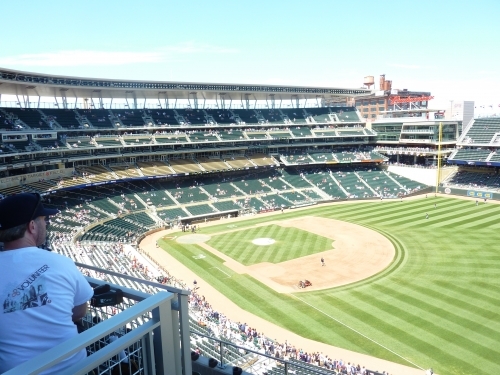 Another problem is that you no longer get a view of the surrounding area from the upper deck concourse, (a la Seattle, San Diego) because concessions are now on that side. I still think from a concourse perspective it is still a pro: just having an open atmosphere is more desirable. There is also an economic aspect to this new trend: with greater physical separation, owners have the right to charge higher prices for the lower part of the upper deck because it is more exclusive. It becomes the de facto “club level” of the upper deck (literally with Citi Field and Yankee Stadium). Unfortunately, this feature also pushes the upper deck 10 feet higher and increases the rake of the deck a couple degrees. But if you cantilever the upper part over the lower part, the highest row is actually closer to the action than it would have been otherwise. Split upper deck at Target Field, opening the upper deck concourse to the field of play. So even though it’s a bad thing overall for sightlines, its adverse effects are probably a bit exaggerated and can be mitigated. It’s a mixed bag in my opinion. It really depends whether you value the psychological “embrace and release” concept associated with the portals or the open atmosphere to the field, though limited in the upper deck. I like breaking up the monotony of an imposing upper deck into multiple parts, especially when you face the reality that few teams sell out. It contributes to the “neighborhood seating” concept that eliminates that sense of isolation and provides greater connectivity between fans. This may seem pretty paradoxical at first, because there is a greater degree of separation between seating sections. But understand that on many occasions, these new ballparks will be less than 70% full, thus breaking up the seating makes the ballpark feel less empty, and it inevitably places the individual fan in close proximity to other fans during games under capacity. As a kid, I remember people talking about “make out corner” in the top rows of large imposing upper decks because they were so removed from everything else at low capacity games. To illustrate, just look at New Comiskey Park’s notoriously large upper deck in the 1990s, when they were drawing 17,000 a game. Breaking up the seating structures, thus giving fans multiple smaller seating options, can lead to a more intimate fan experience in cases like these. So called neighborhood seating at Petco Park. Split upper decks in newer parks accentuate this concept. Of course, the counterpoint is there is no greater sense of connectivity when you have a full, large upper deck, like Old Yankee Stadium. You are engulfed by an unprecedented sense of collective effervescence. So sure, uninterrupted masses of people are ideal, but since sellouts are often not the case in most markets, the neighborhood-seating concept is inevitably a benefit that provides greater intimacy. While not a lasting innovation like the splitting of the upper deck, gaps in seating structures are seen starting around the millennium, contributing to the neighborhood-seating concept. 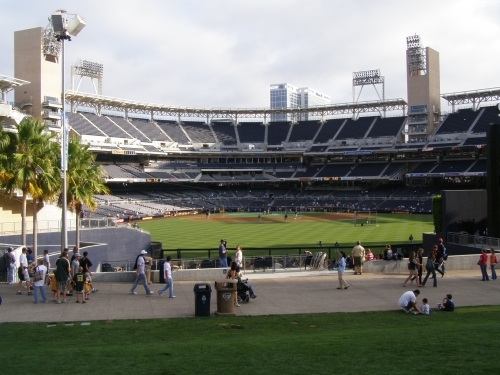 In multiple ballparks, the physical structure is broken up into multiple decks or buildings. 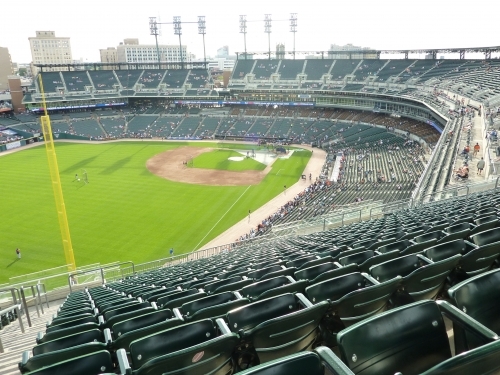 Pioneered by Comerica Park in Detroit, many ballparks have implemented this innovation for both functional and aesthetic reasons. While many argue this breaks the unity of the ballpark, this concept is completely sound from a functional point of view, even though its aesthetic merits are debatable. Comerica Park in 2010. Upper deck separated in right field for better sightlines and egress. Some also say this is a nod to Griffith Stadium as well. First, it allows for a different upper deck height in the outfield vs. the infield, increasing the field proximity of many seats. Lets compare Jacobs Field and Citizens Bank Park. In both ballparks, the sequence of luxury suites pushes the upper deck higher in the infield and down the lines. But the luxury suites don’t continue into the outfield. So Instead of maintaining the same rake, Citizens Bank Park’s outfield grandstand breaks away from the rest of the ballpark, lowering itself to the field. Jacobs Field outfield upper deck remains at the same level for no functional reason. Why should the outfield upper deck be as high as the infield one? Second, it eliminates many awkwardly angled seats just past the infield and provides an effective way to angle the remaining seats down the line toward the infield. Breaking the upper deck down the line naturally allows those seats to be oriented toward home plate, eliminating the awkward seats right before the natural point of reorientation. In addition, the literal gap itself creates an open area, facilitating better egress and allowing the ballpark’s surroundings to seep in.